This 35-acre property includes a grand log chalet situated at 8900 feet above sea level. The top floor, one large room with a vaulted ceiling, boasts picture windows facing the Gore Range. The wood burning stove generously heats this level. A propane furnace provides additional heat for the whole house. The living room area has several couches (one of which is a sofa-sleeper) and a sky chair. The dining table seats 10 people. The kitchen is large and well equipped with counter space for preparing sizable meals. There is also a half-bathroom on this floor. On the middle level there are four bedrooms, which sleep 8 (2 queens, 1 double and a bunk bed). There is a full bathroom with shower/bathtub on this floor. This is a kid friendly property equipped with toys, books, movies, entertainment system with satellite radio and a ping-pong table. A large solar system provides most of the heat and hot water for a reduced carbon footprint. There is propane and electricity for the utilities. Laundry facilities are available on the bottom level if needed. The deck wraps around 2/3 of the upper level for sunbathing, bird watching, sunrise and sunset viewing. There is a propane grill on the deck for convenient outdoor cooking. In addition, you can enjoy meals on the deck at a wooden picnic table. Just below the house is a fire ring and additional picnic table for cookouts. From the hammock on the deck you can view the Gore Range, Green Mountain Reservoir, and the Williams Fork Range. Deer, elk, and fox are common visitors. Nightfall brings stargazing and the occasional coyote chorus. Songbirds, hummingbirds, eagles, and hawks are often seen. In winter, the chalet's location is ideal for snowshoeing, cross-country skiing, and excellent sledding. Alpine skiing and snowboarding are available at Breckenridge, Copper Mountain, Keystone and A-Basin, all within an hour. Vail, Steamboat Springs, and Winter Park are around 1.5 to 2 hours away.There is Gold Medal fishing on the Colorado and Blue Rivers, and belly-boating on Cataract Lake. 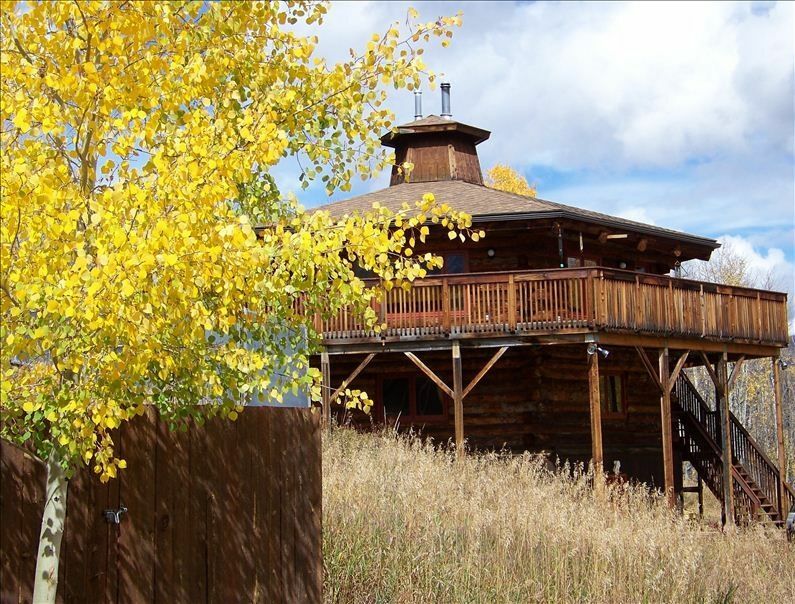 The chalet is surrounded by aspens, so the fall is an exceptional time to visit. There is access to various wilderness areas for sportsmen looking for a comfortable base. Lower Cataract Lake is a short drive away during the summer months. When there is snow, it can be reached with snowshoes or cross-country skis via the road. A number of trail-heads begin in that area for day hikes or camping. The wild flowers are spectacular in spring and summer and the aspen foliage is golden in the fall. The cataract itself is also worth exploring. The location is solitary, serene and private on 35 acres of woodland and sage brush meadows with wildlife as your nearest neighbors. This is a perfect property for a small family get-together or a place to return to after a day of hiking, fishing or hunting. Winter access can be more difficult even with with snow plowing, so contact us directly for more information. We designed and built this chalet, using standing dead lodge pole logs. Our 4 children grew up using this place many times a year, summer and winter. We are now retired, and the children are married and living scattered around the country. We come here about twice a month, bringing our dog and 2 cats with us. We built the chalet as our vacation retreat, and now would like to share it with others. Solitude, serenity, love of the mountains, and enjoyment of the wildlife. 1 set of towels per occupant. Additional towel usage may incur a laundry fee. Everything was great for the return. A little more emphasis on 4wd access to the site would make sense. Our third vehicle made it up with tire chains. The view was worth it. We chose this rental because my family coming up from Texas wanted a good snow experience. They got that and so much more with this place! The driveway is a perfect sledding hill and the cabin is remote enough that you don’t have to worry about traffic. The sunrises are beautiful and it is so peaceful to just enjoy a cup of coffee and enjoy the quiet. The cabin has a well stocked kitchen with necessary items which is extremely helpful as it is about a 40 min drive back to town. Perfect location and a beautiful home. We will definitely be staying here again! We enjoyed the place and the beautiful views. I have always wanted to spend a holiday weekend in the mountains with my sons. We made a fantastic choice in this cabin. The cabin was warm and wonderful. My sons were fascinated with the thermocouple fan on the wood stove. I loved being unplugged from everything. It was so peaceful. It forced family time fun. We put a 1000 piece puzzle together, read books, watch a few movies, and went on several hikes at Crater Lake and Surprise Lake. Our puppy dog just loved all of the snow. A couple of friends spent a few nights with us after skiing in Keystone all day Friday and Saturday. We made several great meals. The kitchen has all of the amenities you will need. (Dishwasher would be nice.) We are making plans of coming back during the summer. We had a great time exploring around the property, making trips to Lower Cataract, and enjoying the spectacular deck. Can't wait to come back as soon as we can! What a cool mountain cabin!!! We loved our stay here. The cabin is unique and was a great fit for our family. We loved hanging out all together on the floor with kitchen/living room. We played ping pong, horse shoes and put together a couple puzzles. The open and rustic feel of the cabin was very cool. The proximity to Green Mountain Reservoir and Cataract Lake was awesome. We went fishing in both! We even rented a pontoon boat at the reservoir and had a fantastic day on the water. We wished we could have stayed a LOT longer. Next time! We do apply holiday rates to various holidays, including Thanksgiving, 4th of July, Christmas/New Years, Memorial Day, Labor Day, President's Day, MLK Weekend, and other holidays as deemed appropriate. Specific holidays have a different rate structure for the entire stay. MLK, President's Day, and Veteran's Day rentals cost $350/night. Memorial Day, Independence Day, Labor Day, Thanksgiving, Christmas, and New Year's Day stays cost $400/night. A revised quote reflecting the holiday rate will be provided upon inquiry. We will continue to offer discounted weekly rates, based upon staying 7 nights. If renting for more than 7 nights, the entire rental rate will be calculated at the daily rate for a week, multiplied by the number of days at the house. We require a $150 cleaning fee that is to be left at the cabin upon departure, for our house cleaner. Not doing so will result in a $10 surcharge deducted from your deposit, along with the cleaning fee amount.